Students and Staff get to participate in an “Ugly” Holiday Sweater Day! 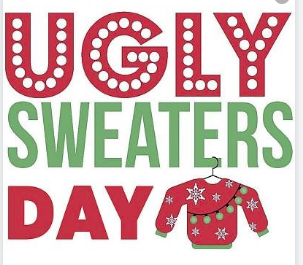 Grades 6 through 8 get to wear sweaters on Tuesday, December 18th. Grades 9 through 12 get to wear their sweaters on Wednesday, December 19th. Sweaters can be worn with dress code jeans and please keep all images and text on sweaters school appropriate. Happy Holidays! https://harmonypublicschools.network/hsifortworth-new/wp-content/uploads/sites/96/2019/02/logo-hsi-fortworth-white-1.png 0 0 aarikan https://harmonypublicschools.network/hsifortworth-new/wp-content/uploads/sites/96/2019/02/logo-hsi-fortworth-white-1.png aarikan2018-12-05 13:01:112018-12-05 13:06:32"Ugly" Holiday Sweater Day!